The unique black / off-white Capasanta garden set is both on-trend and clever. Its two chairs, two footstools and side table stack together for easy storage. 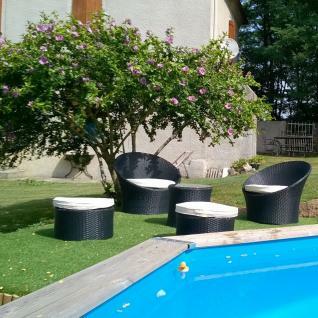 Polyrattan has become an on-trend material thanks to its fine quality and resistance. 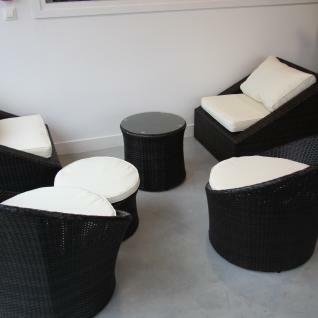 Thanks to its resemblance to natural rattan, polyrattan gives this set a modern, designer look. The Capasanta can therefore be set up either inside or outside. Its elegant cushions are finished with bound edges. 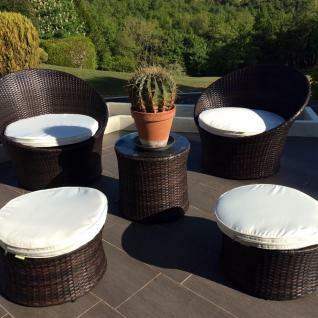 The black / off-white Capasanta guarantees a comfortable place to sit in your garden, thanks to its 5cm-thick cushions. Alice's Garden carefully selects the best-quality materials to weave its furniture. That is why the Capasanta is exceptionally durable! Alice's Garden rattan stands up to the sun's rays and poor weather (snow/rain/salt water). The cushions have removable covers and are water-resistant. This means they can withstand small splashes and drizzle, however we recommend storing them inside when it is raining. To guarantee maximum sturdiness, the frame of the garden sofa set is made from reinforced aluminium (which, by nature, does not rust). Aluminium frames are also lighter than steel ones.